Good week to all. We have a long weekend coming ahead YIPEE! I made a lot of progress yesterday on Krimson Khat. Sorry that I never got to posting a photo of the quilt before I started the sewing. Once I had it laid out to assemble I just took off with it and before you know eight rows came together of this eleven row project. I have the blocks assembled on all eight to get it off my "Design Wall Floor" to make room for the last rows to be arranged. Krimson Khat really hogs the space. I think I'm liking this one as much as Kool (you will need to check out my website http://www.kwiltnkats.com/ to see Kool). Hope to get back to Krimson Khat later today. Check out all the other Design Walls on http://www.patchworktimes.com/. I've inserted a button for you to get there quick. I've made lots of progress on Krimson Khat, but still have quite a bit to go with assembly. There are four major elements to make and I've got all of them done with the exception of 12 bear paw blocks. I've was making a little of each element at the same time to make sure I've spread all the red and neutral scraps out evenly. Sunday is my longest uninterrupted sewing day of the week, with the exception of the screaming that comes from my dryer saying take care of me or I'll make you iron! I hate to iron nearly as bad as dusting so you'd think I'd love to hear the dryer scream! NOT! This photo is what I'm starting with this morning. You'll see that I've taken Krimson Khat to the floor since this red bird (hee, hee....) has grown past the size of my design wall. Of course this invites Kaos and Komotion to get involved too. No you two it's just the name of the quilt, not what can be found under the UNASSEMBLED pieces! It would be nice to show the 25 1/2 yards used this week that Krimson Khat will consume, but it looks like that won't be until next Sunday. I've been a good girl though as I've gotten through another week without purchasing fabric. My EZ rulers didn't make it to Kerry's doorstop yet either darn it. Oh well something to look forward to next week. Go to Judy's blog at www.patchworktimes.com and see other Sunday Stash Reports. I went online and ordered two rulers. I've got rulers that would have worked, but decided to get the real deal according to Bonnie Hunter. I'm probably going to start My Blue Heaven! 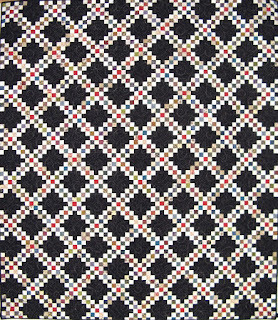 by Bonnie next (http://www.quiltville.com/ free patterns). Thinking about doing this one in pinks ("My Pink Heaven!"? naw it has to start with a K...). Help! The rulers were ordered from Keepsake Quilting; 4 1/2" EZ Easy Angle and EZ Companion Angle. If all goes as I'm thinking the new rulers should be on my doorstep on Saturday (well actually on my sewing buddy, Kerry's, doorstep since we did a joint order to her address). Always nice to have a new gizmo or in this case two! One can never have enough rulers is Kerry's motto. I also found time to go to Judy's blog (www.patchworktimes.com) and post a comment about her post called Seam Rippers dated 8/24/10. Judy posted about favorite tools and what a response she gathered. "What's yours?" is what she asked. I did post a comment that mine must be the seam gauge; you know the metal ones that are about 6" long with the sliding device that squares off your measurement. The one I'm using is one I had when I was in high school (I graduated in '72, still going like the EverReady Bunny). I use mine like a stiletto, never sew without it. I have one other that stays in my travel sewing kit as I couldn't bear to have my olde but goodie misplaced. My next favorite is an eye brow thinning tool learned about in a class with Wendy Mathson that you can purchase at a beauty supply store for around a dollar. It's great for those projects where reverse stitching has you busy for awhile. It is sharp enough to cut through the unwanted stitches, but also blunt enough that you don't nick the fabric like a rotary cutter can easily do. Some interesting favorites like the Purple Thang (got this one too) and a bikini shaver (oh my explain...) were mentioned by those posting a comment. Another mentioned is a hemostat--I learned of this in a class by Bette Runnels but never quite got the "got to have" vibes that she purported. And yes like so many others commented the Clover seam ripper is the best I've found on the market--except for it's sheath which gets lost in my sewing table way too easily. 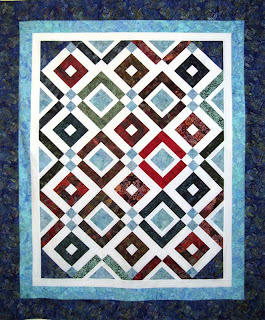 Yesterday I received a block exchange kit from my work guild's 2010 project; this one is Shelly's. 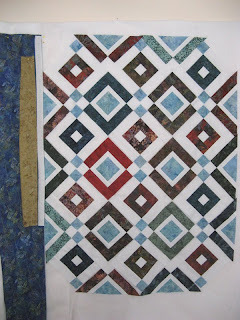 It is paper pieced and adds to a project she's been working on for awhile. It makes a Mississippi Wheel of Fortune. My kit contains very bright batiks in lime green, two shades of orange, yellow, and two shades of blue to make one block. I do love a challenge although I'm not particularly fond of constructing circles which is what this block is. I do however like the way circles look in quilts, its the getting there that awh hurts. More later as I get this one put together. I have until 11/10 to finish it--shall I do like others and wait until "D-Day"? NOT! I'll be hand sewing tonight if the Netflex movie on store is any good. So far it's not sounding like one of the movies I would enjoy.... Otherwise I've got more bear paw blocks ready to assemble. I'll be on again on Sunday for the Sunday Stash Reporting. On my design wall this week is Krimson Khat. This one will take me awhile for sure. Lots of pieces, which is just the way I enjoy my projects. I've got to make 30 of the nine-patch block; 20 done, 10 to go. I've got to make 120 of the bear paw block; 36 done and a long way to go. The bear paw blocks come together like the one on the far right with neutral sashing between the four blocks and a 2" red square in the center. I like the way the border units come together, but that's a little bit down the road yet. I had quite a bit of time Sunday to sew between all the weekly chores, yuck! I'm certain to have more progress when I blog again on Wednesday. 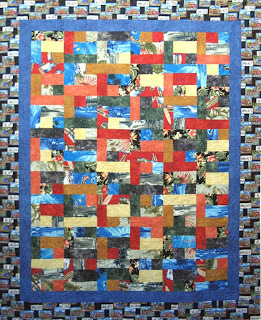 Go to Judy's blog at http://www.patchworktimes.com/ and see what everyone else is up to this Design Wall Monday. Since Wednesday I've been spending time between sewing and cutting blocks and pieces for Krimson Khat. It is coming along real nice. I've had to dig deep in my stash for neutrals. Isn't it always neutrals that we run out of? I'm not recording any fabric used this week since I'm not finished with the project, but once I do you'll see 25 1/2 yards reduced from my stash! I do have a couple of quilts that I picked up this weekend from my quilter, Kerry's Quilting. Kupkake and Flip Flops. Kupkake has been made for my two and a half years young niece, Morgan. This one was fun to put together. Several of the cupcake blocks were made in an exchange with members of my company's guild (yep we have a company sanctioned guild how cool is that?). I've yet to decide on the fabric for the binding, but I'm leaning towards the pink that's in the quilt now. This one is from the pattern Hey, Cupcake!... by Custom Creations. Kupkake finished at 44" x 55". 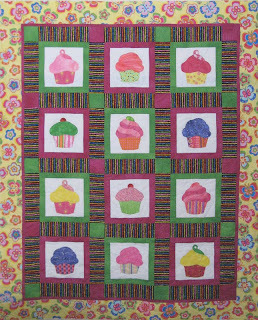 The quilting pattern is cupcakes each with a candle and loops in white thread throughout. I used a solid yellow fabric for the back allowing the quilting pattern to show up. I have a couple of extra blocks and have been considering a pillow, but instead I may just put the rest together for a charity quilt. Flip Flops is the completion of a friend's UFO. 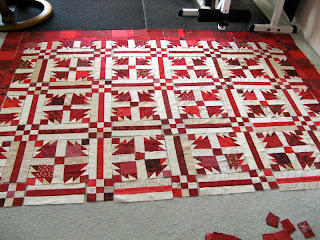 It was started by her many years ago and abandoned as I recall because of some sewing dilemma involving the size of some of the blocks over the others. Well I decided to put the remaining few blocks together and cut them all to the same size and assemble. I didn't have the original pattern for block placement but this one works. I added the blue inner border to separate it from the business of the blocks and the outter border. 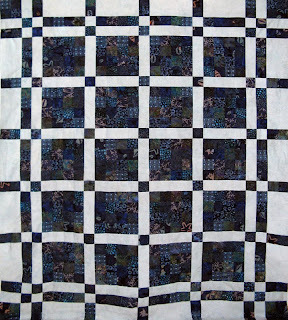 It's quilted in blue thread in a flip flop pattern, real cute too! The back is blue with brown yukalaylees scattered about. Flip Flops finished at 64" x 80" and will be donated to Project Linus. I'm sure some teen boy will be thrilled with it. Not too much sewing machine time so far this week. This will change later in the week. Monday one of my guild's, Canyon Quilters, met for the monthly meeting. This meeting was the annual philanthropy gathering. Members are encouraged to bring sewing machines and/or tools to help move along charity quilts that are in all different stages of assembly. I worked on cutting several Warm Wishes kits. Some were made better by a generous donation of fabrics that evening by one of he members. Tuesday I started pulling from my stash any red or neutral fabrics that would work for my next project called Dove in the Window by Glad Creations, Inc. I've coined my project Krimson Khat, which is the "K" version of a red bird. I selected this project because of all the piecing; something that keeps me involved longer than the last several projects! As it turns out my Stash Users System had me pretty much ready to sit down to sew. 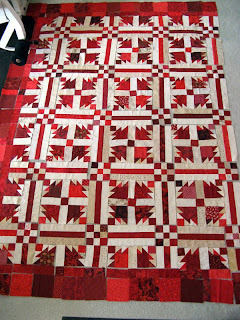 With the 2" half square triangles already prepared from leftovers of a previous project except for 33 of the 400 required and all 120 2" squares in both red and neutral already cut. 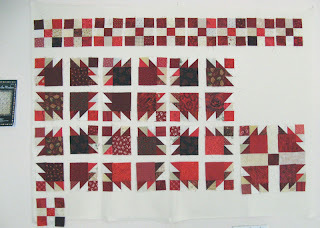 I do need the bulk of the 3 1/2" red squares, as I have only 25 of the 120 required. So to the red fabric tote I'll go.... 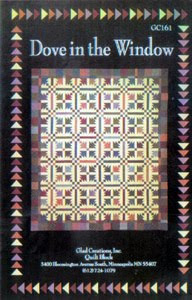 The pieces mentioned make both the Dove in the Window and Nine-patch blocks. 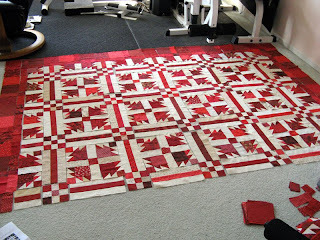 All that is left is to pull together the sashing pieces and the border units. Tonight has me in the red fabric tote pulling enough to cut for the sashing pieces and the border less another 38 2" red squares already cut :).... I've also been rummaging around in the neutral fabric tote too! This project is wonderful as it's taking all kinds of scraps. This week I'm going to work on some 4-patches. A little bit of 2" strip stash management if you get my drift. I'll have my eyes open for reds and ivory's for a project I'm collecting for called Dove in the Window by Glad Creations, Inc. I'll be adding them to existing half square triangles that are scraps from a Bonnie Hunter project I'd worked on recently for the Sunshine Guild Opportunity Quilt. Hope you have a great sewing week. I'll share pictures with you tomorrow on Design Wall Monday Katching Kisses. Not sure what I'll start next. I've been thinking about working down my 2" strips stash into four patches. There's sure to be a nice Bonnie Hunter pattern that I can use them on. Monday and Tuesday this week were spent hand sewing down the binding on Krossroads. I've selected the background and backing fabrics from my stash already. A creamy light beige sort of lacy looking cotton for the background and a beautiful teal/blue lightly floral batik for the backing. I thought I had chosen most of the fabrics for the top, but have decided although I have enough FQs to accomplish it, the grouping lacks contrast. I had two identical eight piece FQ kits in teals and light blue selected--yes they are scrumptious--just love teals, but will need to dig into my stash for something that will work better. I may even change the backing and go to a totally different color way. Maybe orange/red/yellow instead of teal/blue/green... I did cut the background fabric since I'm certain this project will be continued when the stash is right! 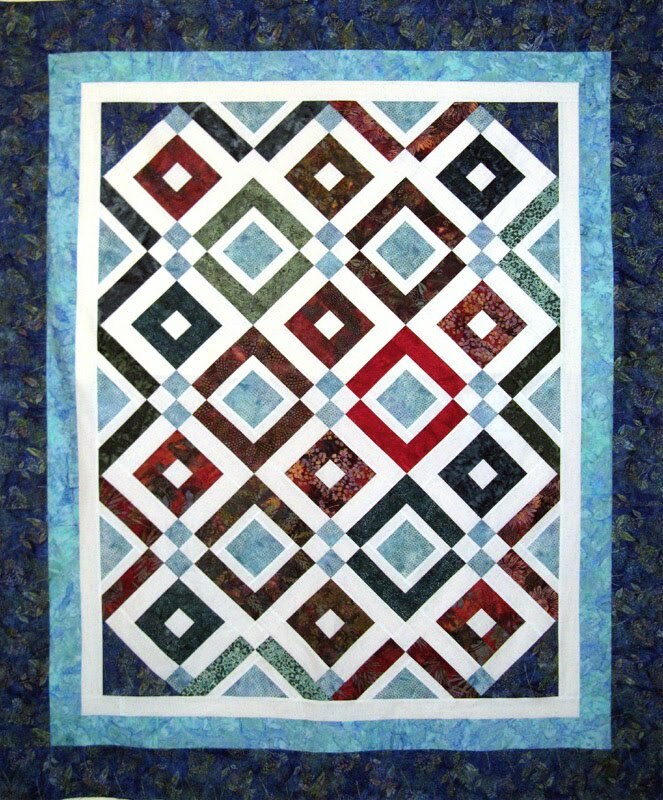 The pattern is featured on the cover of Quiltmaker's Jul/Aug 10 issue. Tonight it's back to Katching Kisses unless the next Damages DVD arrives! You can see any of my finished projects on my website. Enjoy the rest of your week. Here we are again another fabulous day of design walls. There certainly are some wonderful projects going on and excitingly finished this Monday. We sure have a bunch of creative participants in our group. Such a thrill when the last seams come together. Then it's time to start on another. With my library of patterns and stash there is no shortage of something to work on next. It just becomes a matter of which project. This week I'll be working on a Cozy Quilt Designs pattern by Daniela Stout called Romantic Getaway which uses 2 1/2" strips. It comes in four finished sizes from Throw to King. I'll be making the Throw at 65" x 79". 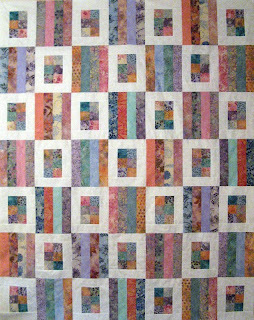 It will use up about half of the strips I have from the Hoffman Bali Pop Berry Bliss collection. I have a medium blue batik with a small tone on tone design for the Accent and a real nice white cotton with a blue circular pattern for the Background. I'll figure out what looks best for the three borders as it comes together. I do have plenty of the white cotton and enough of the backing to consider for two of the borders. This quilt I've coined Katching Kisses. The large piece of fabric on the far right is my backing. Maybe you'll notice that I pulled out from the Berry Bliss collection all the deeper shades so that they have an opportunity to pull out the Accent. Hopefully I've been able to calculate that correctly or if not an adjustment might be necessary. Stay tuned. 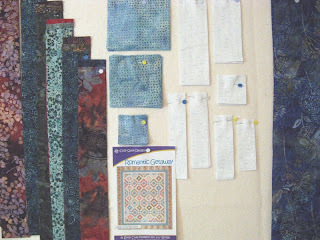 Go to Judy's blog at www.patchworktimes.com and see what everyone else is up to this Design Wall Monday. I had a fulfilling week with two projects being finished. Kerry and I finished Casabarka which she will deliver tomorrow to the Humane Society. It really should do well to raise funds this year in the Fur Ball event that takes place Saturday. We sure did come down to the wire on this project. Next year we'll be sure to start a bit earlier. There are close ups on my website. I didn't leave the house once today. We made a terrific crunchy cabbage salad for lunch and barbecued hamburgers and corn on the cob for dinner. I finished assembling Karibbean while the washer and dryer were going. This project used fabrics from my stash entirely. Not the best photo :(. More batik fabrics and another Bali Pop on tap for my next project, Katching Kisses. So far this week I've only found Tuesday for sewing. My quilt buddy, Kerry and I are creating a quilt for the 24th annual Fur Ball which takes place on August 14th that raises funds for the San Diego Humane Society and SPCA. It is a black-tie gala that gathers in the neighborhood of 500 prestigious attendees to support the SDHS and SPCA's mission and values. We've been supporters for many years now to help make the event successful. Each year our donation becomes part of the For Your Home basket that guests bid on. 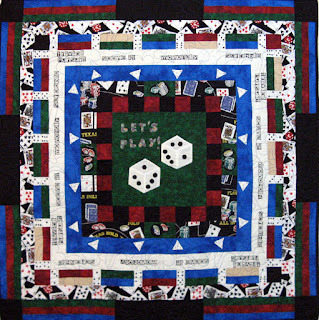 This year's theme is "Casabarka", so in keeping with the theme we've made a quilt that reminds us of Casablanca. The pattern is called The Truth About and Dogs, by Kristy Duncan of Hughenden, Queensland, Australia. We started working on the project in June. It must be finished and delivered to the event coordinators on August 9th...YIKES! We are almost finished with only a few more pieces that need additional quilting and a few more pieces that need more embellishment. It is an applique project where we've used satin and blanket stitching to secure the pieces to the background. 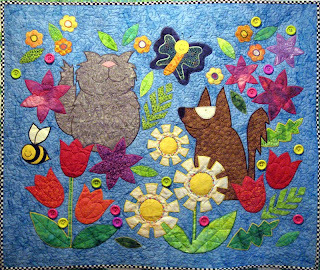 It pictures a dog, cat, bee, and butterfly in a garden of flowers. Embellishments include 1" buttons and too many to count French knots. It's all in very bright batiks that include red, blue, yellow, purple, green, raspberry, white, brown (for the dog), and gray (for the cat). I'll be sure to photo it when it's done and post. Karibbean will have to wait until our "Casabarka" project is finished. Here it is Monday once again. I was lucky to finish what I presented last Monday (Kotton Kandy Kocktail) so my design wall is with a new project. This one is a Timeless Treasures pattern called Blue Moon by Karen Montgomery. 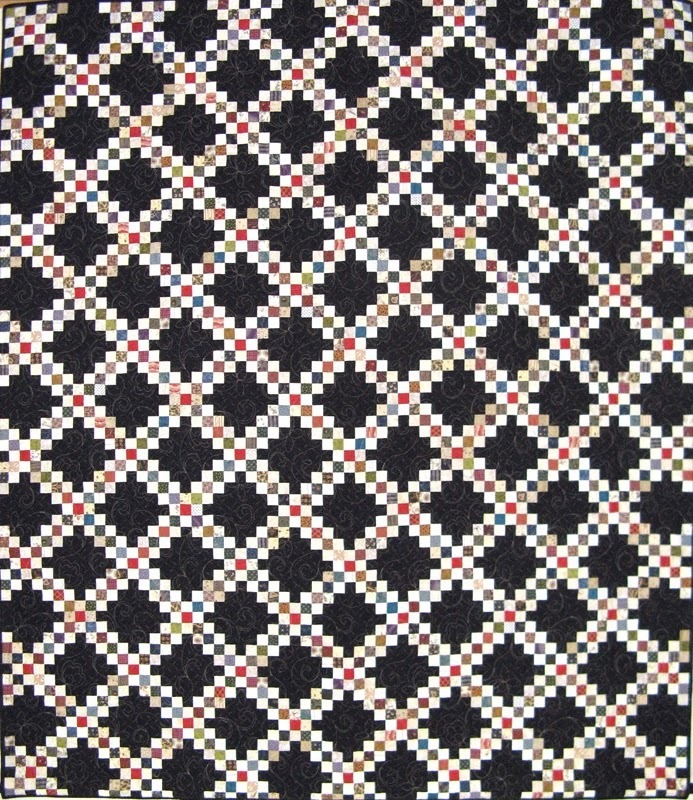 The pattern features the Tonga Batiks line in 12 different navys and white for the sashing. 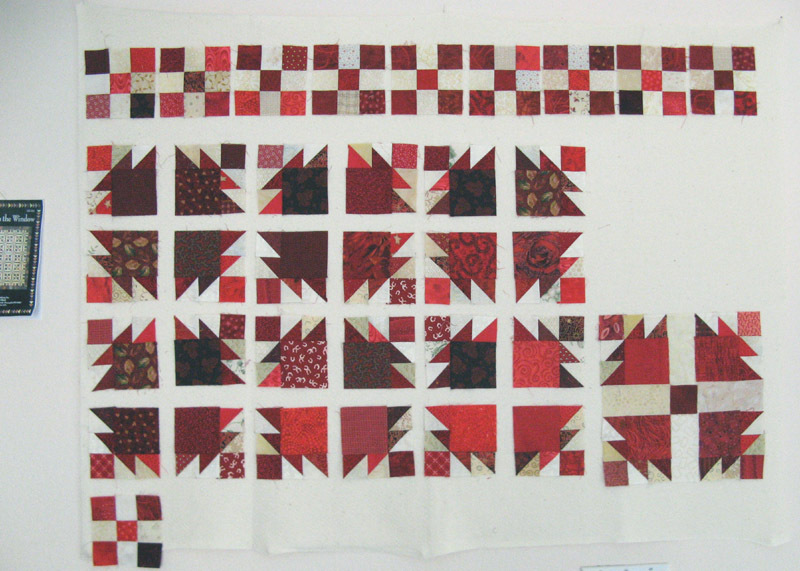 The main block which is 12 1/2" is sewn from four 21" x 3 1/2" strips. The sets are then cut into 3 1/2" units and lastly sewn into a 16-patch block. 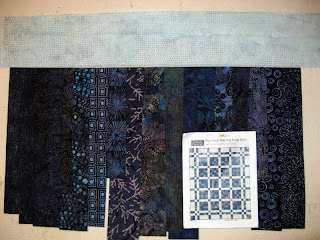 I'll be using my navy batik stash and instead of the white for the sashing I'll be using that light blue batik with the small design that runs above the navy strips. I think the sashing gives this design a lot of movement. It's hard to tell from the pattern picture on the design wall but the second sashing counting from the outside of the quilt uses the 3 1/2" units from the basic block. I like how the design also incorporates the 4-patch blocks. Best of all this 81" x 96" quilt will use a little over 9 yards of fabric for the top alone. I've got all the strips cut in the various widths. Need to start sewing and sub cut the background strips. This one should go together fairly quickly. I'll get back with you on progress later this week. This project I'll call Karibbean. Not only is it the start of a new week, but the start of another month. August already! We had a beautiful day in San Diego today. The sun was shining and a real nice breeze was coming in off the ocean. Several friends got together to enjoy it and remember the birthdays of two special men, my brother and a close friend recently parted. They both would have enjoyed our celebration at the Green Flash on such a beautiful day just off the beach. Later in the day after the chores were done I headed up to my sewing room to put the finishing touches on Kotton Kandy Kocktail. This project came together nicely this past week. It finished at 55 1/2 by 70 1/2. I also got the back pieced together. I have some leftover strips from the Cotton Candy Hoffman Bali Pop that I used and some from my strips stash to make the binding as well. This project used fabrics from my stash entirely. My next project is already selected. It will be from the Timeless Treasures pattern called Blue Moon. Mine will be coined Karibbean. I've got batiks to use for this project; several dark navy prints and a light blue that has a small design for the background that will pull all the navy prints together. More on Karibbean tomorrow.